The fine pianist, arranger, and scholar Keith Ingham left a message on my phone in July, saying that he had recorded a session with a singer who was very good and whom I would like. Keith hasn’t been wrong yet. 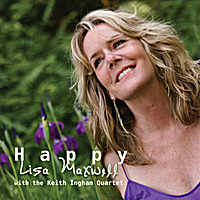 Thanks to Keith, I had the pleasure of hearing Lisa Maxwell, and I hope you will share that pleasure. Her brand-new CD, accurately called HAPPY, is just out on CDBaby and will be on iTunes in a few days. It will soon be available in the tangible form (disc plus notes plus jewel box) that some of us love so well. Whatever form you find it in, it’s delightful. Easy on the ear, as they used to say, but not Easy Listening. There, you can hear brief samples of each track — samples that should give you a clear idea of what a genuinely unaffected singer Lisa is. And the playing is delightfully cohesive: Keith’s supportive lines, with never a superfluous note; Frank Tate’s deep woody sound and his splendid pulse; Al Gafa’s muted chimes, Steve Little’s padding brushwork; Ben Wittman’s just-right percussive seasonings.